I've been collecting pop culture crap...uh, collectibles for 30 years, in one form or another. 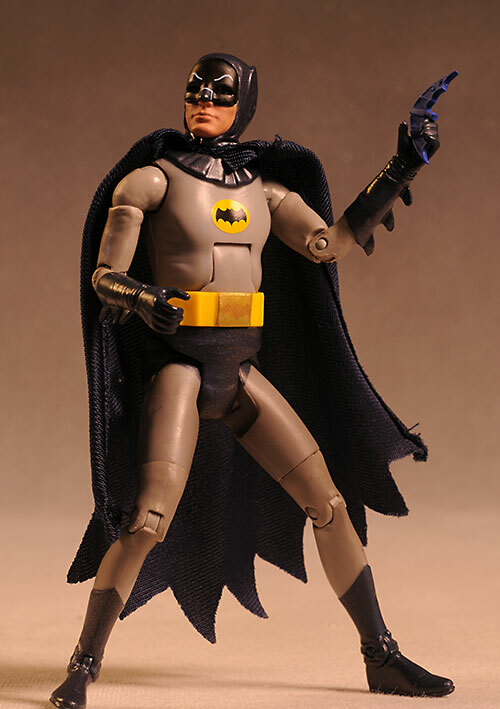 And in all that time, one thing has remained consistent - my desperate need for action figures based on the 1966 Batman television show. It's been a dream of mine bordering on obsession, and is the one license that was always the answer to the question "what property, more than any other, do you wish they'd make?" I never thought I'd see it happen, what with all the talk about how complex it would be, how the license was all mixed up between multiple companies, and how most of the actors never signed off to allow any sort of product to be produced. But if people want something badly enough, they find a way to make it happen. And happen it has, and in a big way. Multiple companies are making dozens of figures in just about every scale known to man. Some, like the Hot Toys sixth scale figures, are going to cost that last kidney, but aren't you're only option. 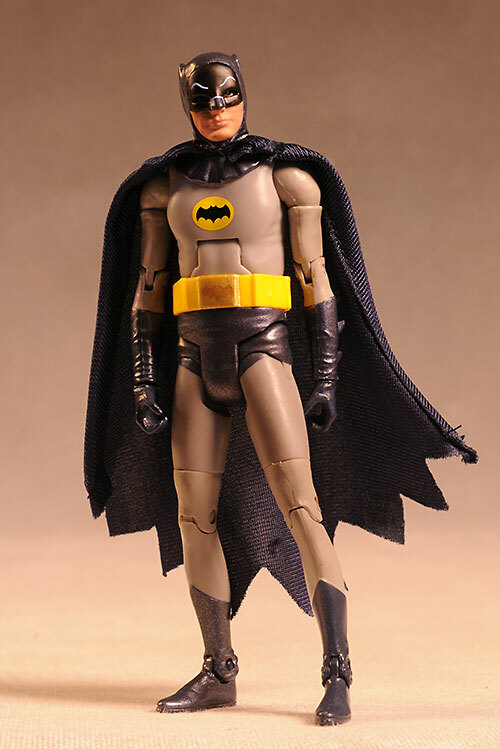 Mattel is stepping up with an affordable line of 6" figures, as well as a Batmobile for them to ride in. 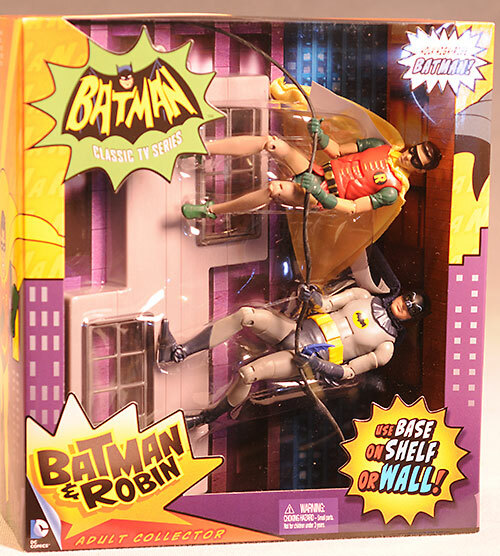 A lot of the Mattel product will be here very soon, but the only thing to arrive on my door step so far is the two pack of Batman and Robin, complete with wall diorama. I'll be checking it out tonight, with plenty more coming in the next few weeks. You can find this set online or at your local comic shop for around $30 - $35. The bright colorful box hearkens back to the goofy style of the show, and I wouldn't have it any other way. It's not collector friendly, but it does do a nice job of showing off the figures if you're a MIBer, and it's quite sturdy. Another advantage with boxes is that they are easy to store and display on the shelf, much more so than card back/bubble packages. 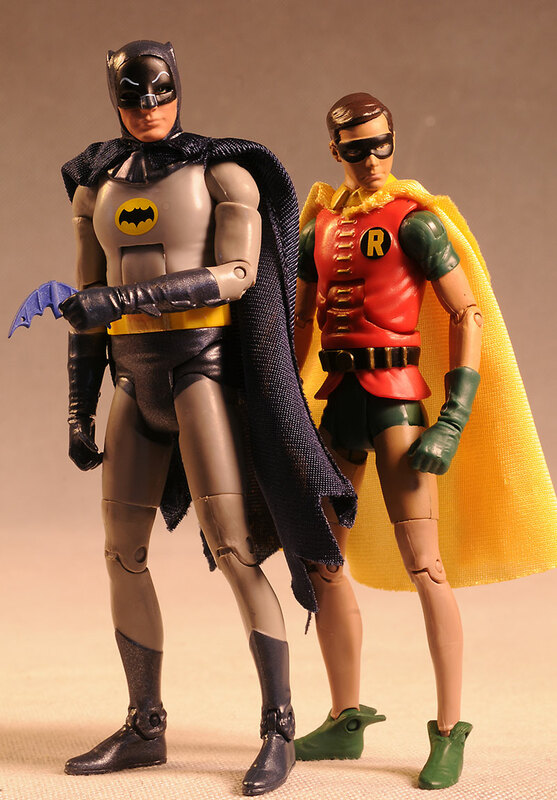 The basic look of both figures is actually quite good, although I think they did a better job capturing the Adam West likeness. I love how deeply set the eyes are, and they've done a nice job on the physique of both. There was a campy goofiness to this show - it was so cheesy you could smell it. But that was what made it popular then and now, and I think they've reflected that in the style and design of the figures. I have one minor nit with the actual sculpting - Batman's belt. The pouches aren't quite right, and even at this scale it's noticeable. So if I like the sculpts so much, why the low score? One reason only, but my God, it's a huge reason. Both figures have cloth capes, which I'm including as part of the 'sculpt' category, even though it's a bit of a stretch. I'm fine with the cloth - they don't cause the figures to topple over, and they will allow them to fit in the Batmobile or other vehicles. It also reminds me of the old Super Powers line, another favorite. But they have two issues that hurt the overall look, and one of them is just outright absurd. 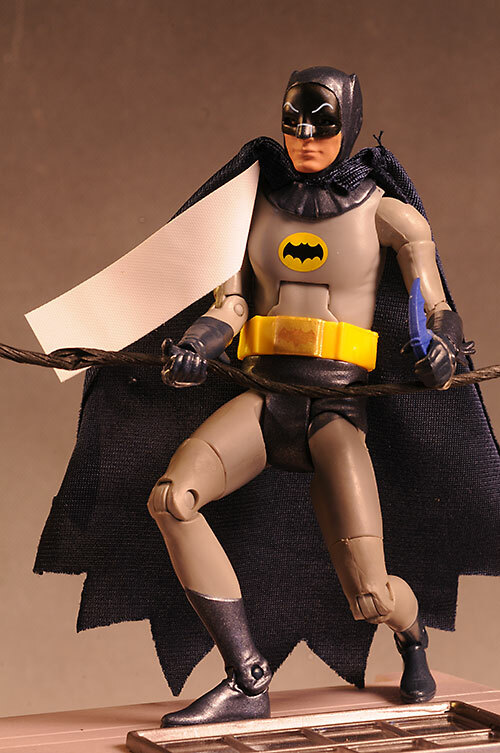 Both capes include wires along the edges, which allow you to pose them. In the top photo in the review, I posed the figures climbing the wall in the same way that they actually did it on screen - walking horizontal instead of vertical, with the perspective turned 90 degrees. It was always hilarious on the show, because it was so obvious - every week, various famous people would poke their heads out of the windows, and you could tell they were leaning at an odd angle in an attempt to make it look right. The wires in the cape helped me capture this same look for that first photo. However, the wires are too bulky, and getting them to work is pretty hit or miss. I would have liked the capes better without them, although their inclusion isn't the biggest issue. No, the biggest issue is the ridiculous white copyright tags inside each cape. In fact, 'ridiculous' doesn't even begin to describe the situation. I took a photo of Batman with the tag in place - there's simply NO way to properly hide it, and you can see both tags in the photo of the package as well. You're going to have to cut them off, you have no other choice. I've never seen anything even close to this bizarre on any figure, and I have no idea why it was necessary here, but these two are taking a major hit for it. These are done in a 6" scale, but they do seem a bit smaller than the DCUC designs. They also have slightly more human proportions, which translates to mean the heads are more appropriately sized to the bodies, and the legs are pretty skinny. These might be a dream come true, but the paint ops are more of a nightmare. Perhaps nightmare is too strong - let's just go with disappointing. That's not to say there's no positives. 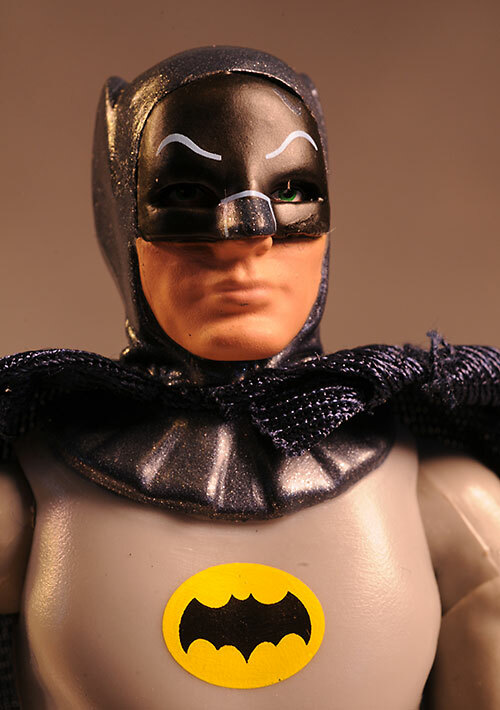 I love the work on Batman's cowl and the varying finishes. The emblems are clean and straight, and the colors are accurate. But there's a fair amount of slop, and some very poor edges. 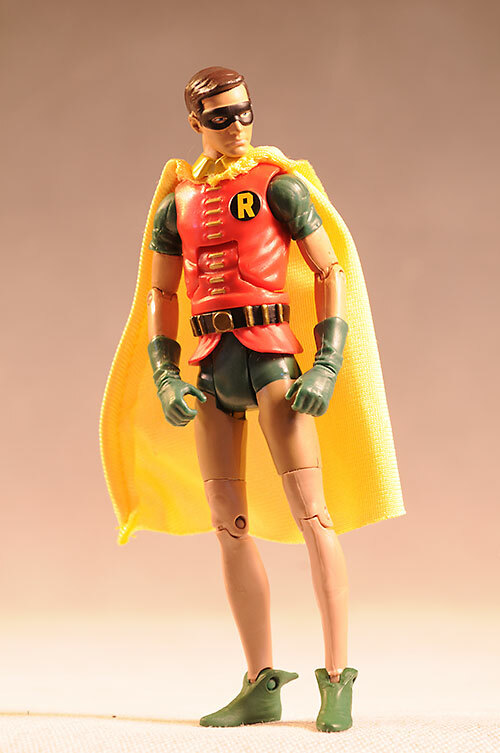 The edge of Robin's mask is more flesh tone than black, and the top of Batman's boots don't quite line up. Worse, they tried to mimic the brass buckle on his belt with some sort of weird paint, and missed the mark entirely. I'm hoping we see the overall quality on the paint work improve over time. 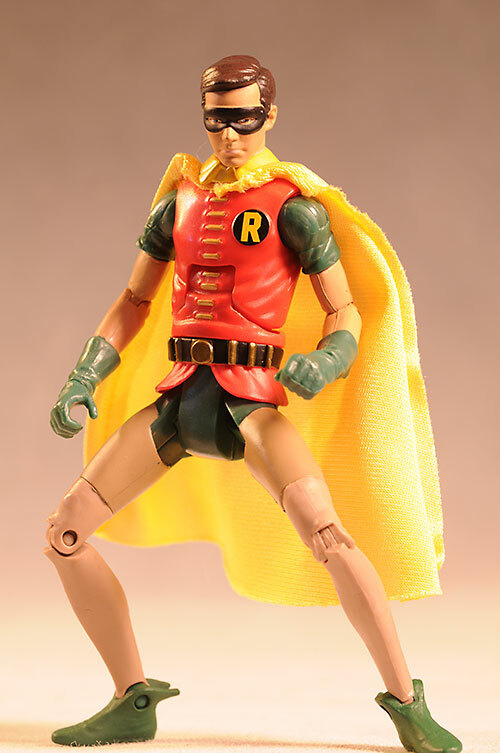 Much like the DCUC figures from Mattel, there's plenty of useful articulation here. 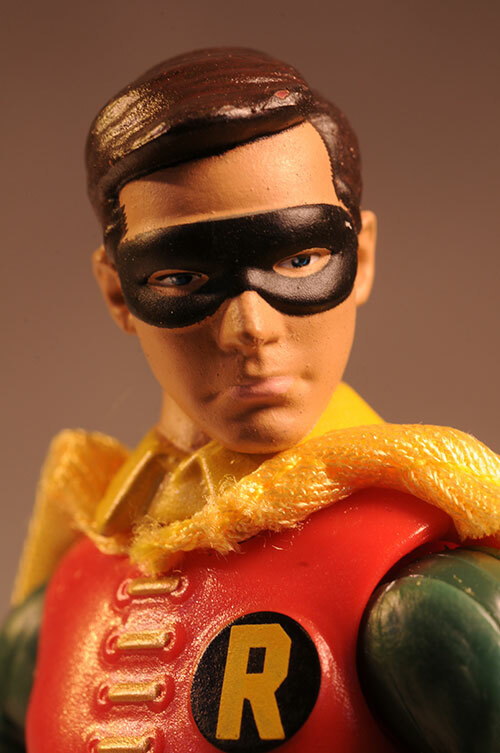 Batman has a ball jointed neck, but it appears as though Robin does not. I couldn't get it freed up, but perhaps you'll have better luck. 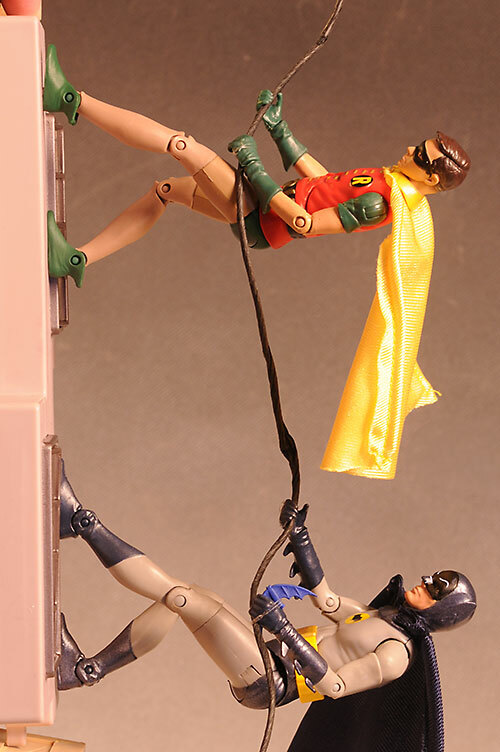 It hurts Robin a bit too, because being able to tilt Bat's head back allows him to look better on the wall. Ball shoulders, cut biceps, thighs, waist and wrists, pin knees, elbows and ankles, hinge hips, and an ab-crunch all work well together, and allow for some great poses. The joints do feel a little weak though, especially the knees and elbows. The plastic they are using for the pins seems a bit soft, and I hope we see that corrected over the series. The figures come with a display base that can sit on the shelf or hang from the wall. It looks like the wall from the show, complete with two opening windows. I would have liked it if it was slightly larger and wider, but that's a minor nit. As I mentioned earlier, the first photo is with the base sitting on the shelf (propped up to allow the Joker to pop out), while the other photo below and to the left was taken with the base against a wall. You can hang it from a small hook on one end and the posts for the feet are tight enough to keep the figures in place. To go along with the base, there's a length of bat-rope for them to climb. It's held in place in their hands with rubber bands, and once you remove the bands, they will have a much harder time keeping it in their mitts. Finally, Batman also has a batarang, done up in the style of the show. It's a good scale, and fits easily and tightly in his hands. With the release of so much product, we have to assume that we'll be seeing the show finally get out on DVD and Blu-ray. That means more kids will finally get to know this show, making the appeal of these figures that much greater. With a price around $30 - $35, you're paying a pretty average price for each figure. With a cool display base, you won't feel ripped off by the two pack cost. Remember that once you take the rubber bands off the hands, getting the rope to stay in place is much harder. I'm ecstatic that we are finally getting figures based on the classic show, but that doesn't mean they're perfect. 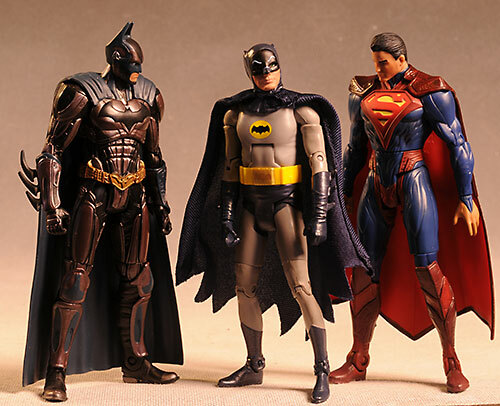 I do suspect that they'll get better as they go along - what Mattel was showing at SDCC looked great - but the goofy huge tags and wires in the capes ended up hurting these quite a bit. I shouldn't have to take a pair or scissors to a figure just to make it presentable. 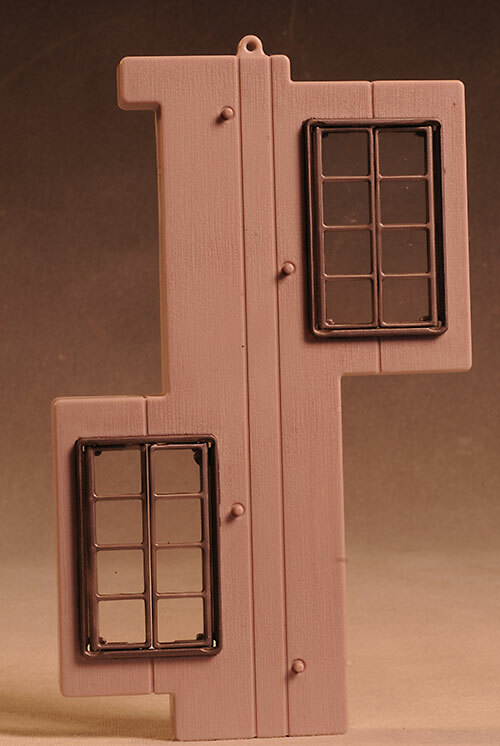 Add in some below average paint work, and I just couldn't give them the sort of score I'd hoped. Still, I'm happy to have them, especially with the wall display base. I'll be buying the entire series, so you can expect plenty more reviews from me on the Mattel line, as well as the figures from DST, Hot Toys, NECA and others. - Entertainment Earth has the two pack for $33. - has this set for $33, as well as the wave 1 and 2 figures. - also has the singles, but for $20. I haven't checked out any other 1966 Batman stuff yet, but there's a plethora of stuff hitting soon. 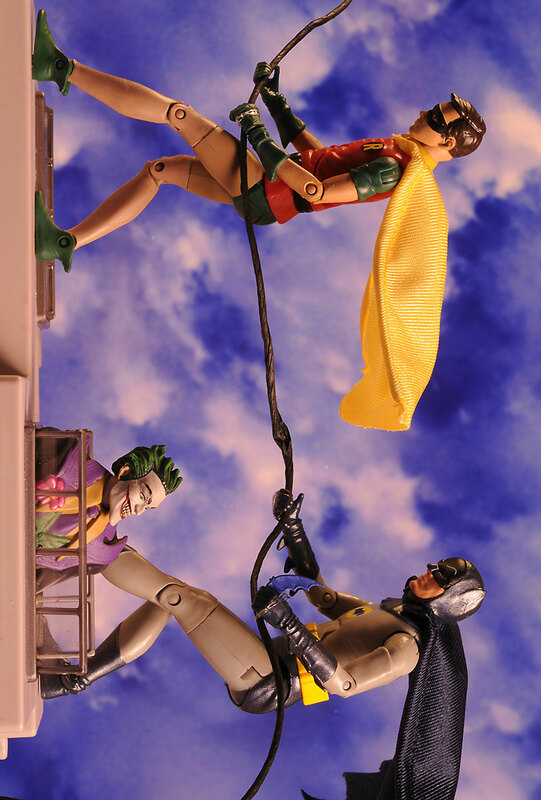 Until then, check out the cool Hot Toys 89 Batman and Nicholson Joker!